Prostate cancer is the most frequent malignant tumor disease of males in the Western world. To better study the causes and development of this disease, Dr. Friederike J. Gruhl, Karlsruhe Institute of Technology (KIT), is developing a three-dimensional model of the prostate. Her work is aimed at modeling natural processes in the test tube (in vitro). In the long term, the in vitro model is to completely replace animal experiments in prostate cancer research. The state of Baden-Württemberg is funding the project with EUR 200,000. Her research project is aimed at developing and applying a biomimetic system. “Biomimetic means that we model in the test tube as precisely as possible the real conditions prevailing in the human prostate,” says Gruhl. The model is based on hydrogels of artificial and natural molecule chains (polymers) that enclose water (Greek ‘hydro’). These chains are used to build three-dimensional structures, whose mechanical properties are very similar to those of cellular tissue. The model developed by Friederike J. Gruhl will be applied as an analysis platform for cancer-related cellular biology research and in particular for studying molecular regulation mechanisms of tumor formation. As it is difficult to permanently cultivate primary prostate cells, i.e. cells taken from the human organism, animal experiments have been carried out so far. In the long term, the new in vitro model is to replace these animal experiments in studies of the prostate carcinoma. Under the program “Development of Alternative Methods to Avoid Animal Experiments”, the Baden-Württemberg Ministries of Rural Affairs and Consumer Protection and of Science, Research, and the Arts are funding the project with EUR 200,000. Using the prostate model, healthy cells of the glandular tissue (epithelial cells) and cells that may cause cancer are to be cultivated. The development of Friederike J. Gruhl also considers the natural cell environment. This includes among others the tissue between the cells (extracellular matrix) as well as its biochemical functions and properties. 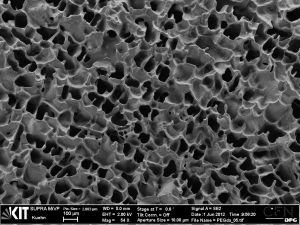 “The crucial challenge is to combine the advantages of controllable chemical properties of hydrogels with those of the naturally produced extracellular matrix in a system,” explains Gruhl. According to the scientist, the hydrogel produced has to be similar to a sponge, but homogeneous at the same time in order to ensure supply of the cells with nutrients and oxygen. Moreover, the material must not contain and release any toxic substances. Friederike J. Gruhl produced various hydrogels and analyzed them for pore size and distribution, formability, and swelling behavior. “For a biomimetic model of the prostate, we need a large variety of gels with different properties in order to fulfill various functions in the model,” says the scientist. Presently, she is working on the characterization of the gels. Then, various hydrogel cell structures will be generated. “It will also be important to determine the impacts of variable framework conditions, such as the presence of various cell types, stiffness and density of the environment, and the biochemical composition of the soluble factors incorporated in the extracellular matrix,” Gruhl says. In three years from now, the project is planned to produce a biomimetic model for use in research. Another perspective is the application of the model for medicine development in pharmaceutical industry.